So far in our Money Makeover we’ve talked about gaining vision, setting a savings target and specific savings strategies. 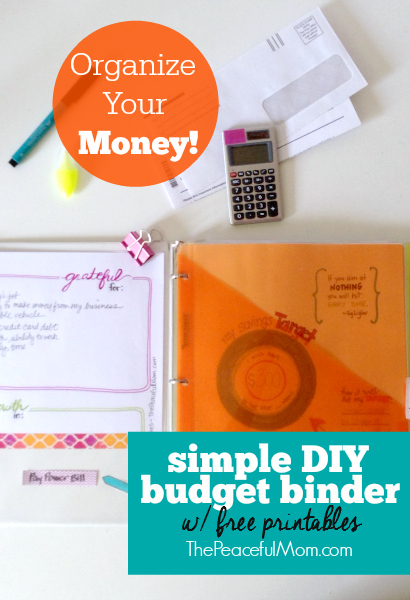 Today I’m showing you how I keep track of each of these elements of our money plan by using a simple DIY budget binder. 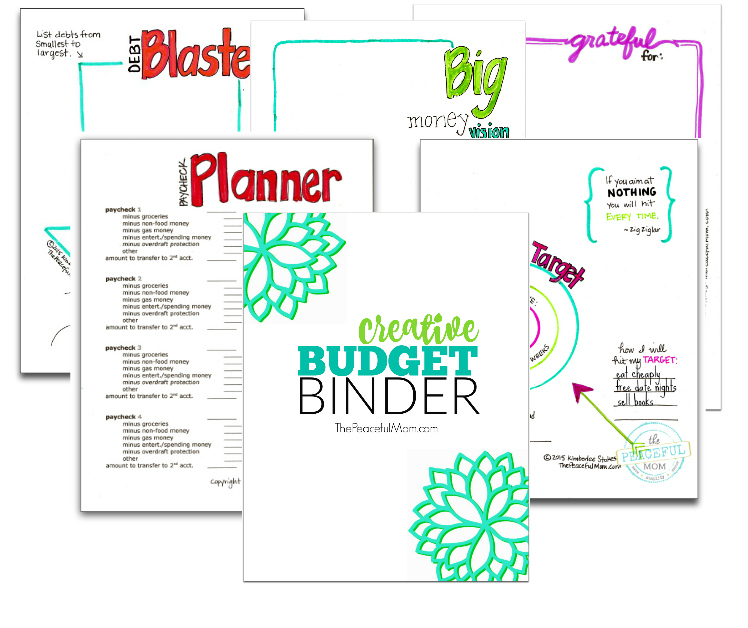 Buy the Creative Budget Binder pages HERE. Many people use online systems to keep track of financial details and bookkeeping but I prefer to use a physical notebook and hand write the details because it cements them in my mind and helps me to stay on track. I have also found that I am much more motivated to keep up with my spending and saving when I use tools that are bright and colorful rather than dull and boring. I need to make dealing with money as pleasant as possible. So here’s a peek into what I like to call my Money GPS because it tells us where we are headed financially and how to get there. 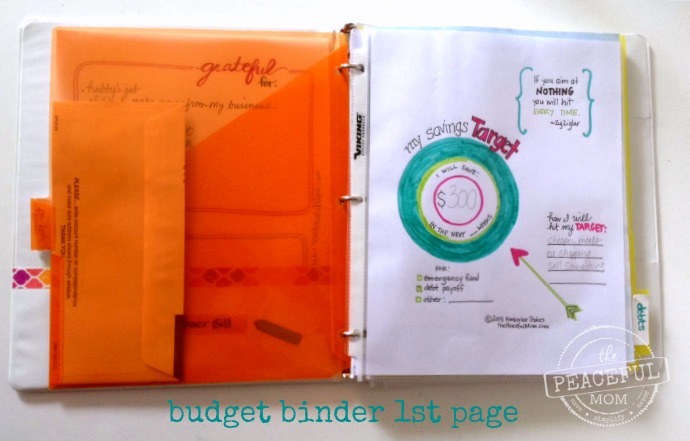 I use a 1 inch binder with a clear plastic cover insert on the front. 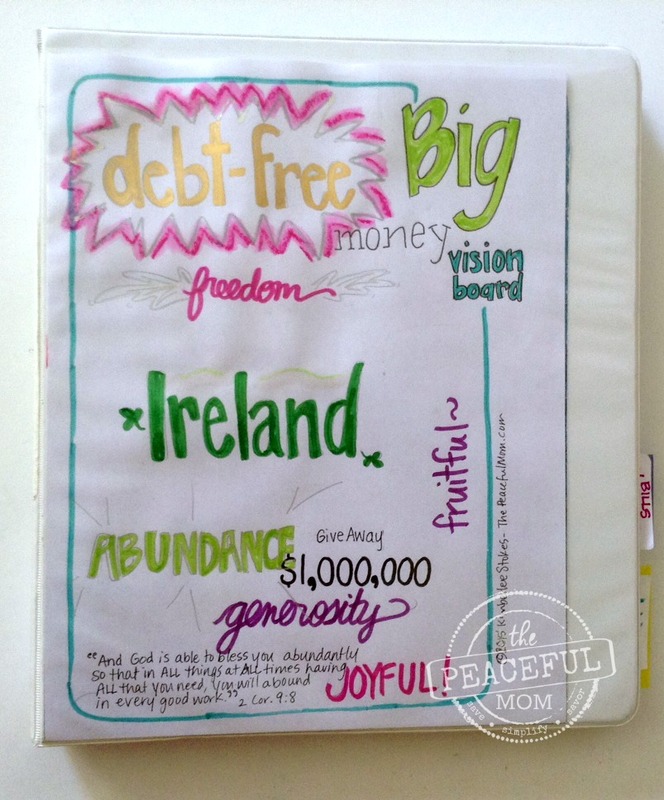 I inserted my Money Vision Page as the cover to keep our financial vision in front of us as we make our day-to-day money decisions. In the front inside pocket I have a copy of my Grateful For/Growth In Play Sheet to remind me to be grateful for all that we have and on the right I have a plastic pocket divider where I place our bills to pay. When I receive a bill in the mail I immediately open it, discard the envelope, write the bill amount in my calendar on the paycheck date before the bill is due and then file the bill here. After the divider I have placed our Savings Target page in a page protector to remind me of our current financial goals. The next section of my Money GPS Planner is the Monthly Spending Section. Once the receipts are recorded they go into the page protector behind the Savings Target Page. At the end of the month I review our spending and place the receipts in an envelope labeled with the month and year which goes into our annual file for taxes. 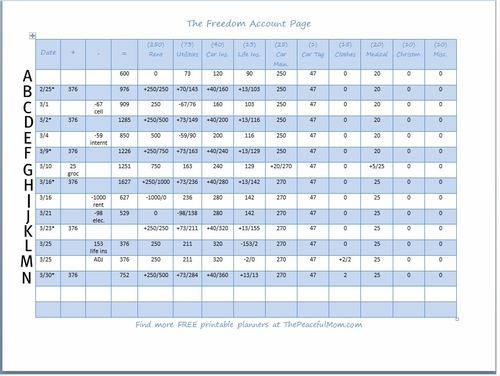 Click HERE to see my next post in which I show you the debt section of our Money GPS Planner. 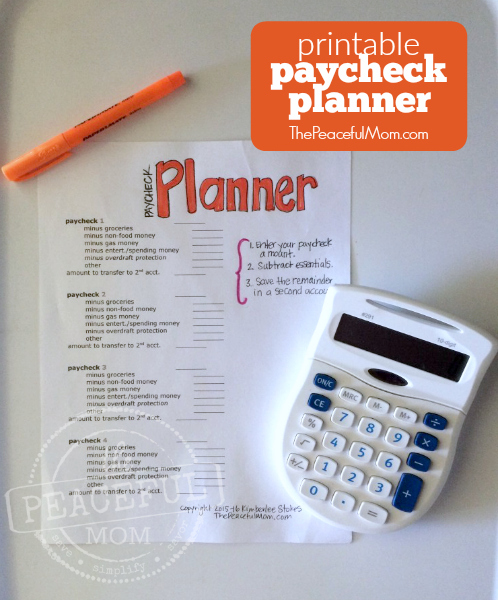 Today’s Money Mission: Set up a Money GPS Planner/Budget Binder for your finances. 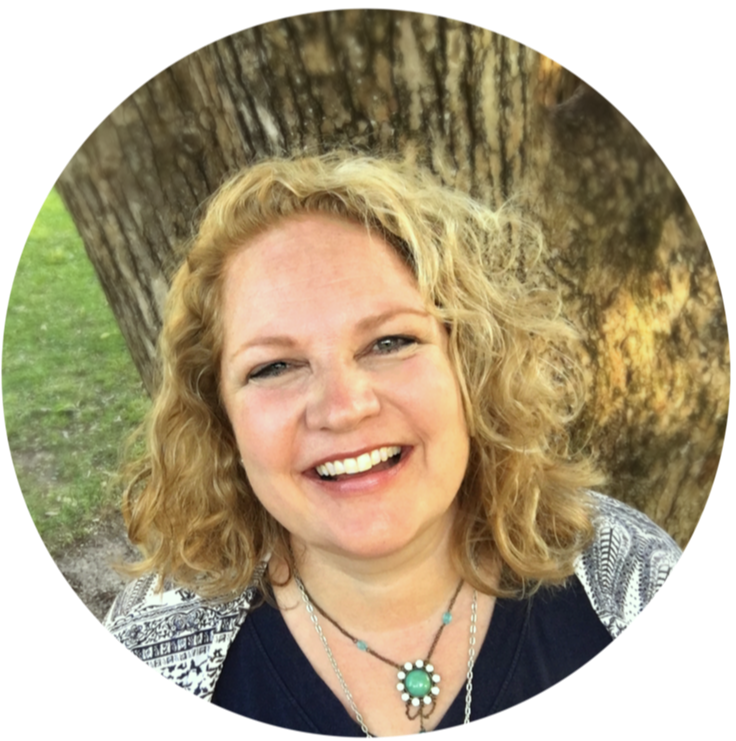 Get them FREE when you join my complimentary 5 Day Money Makeover email course! I too love how cheery the printables are. I need to go back to paper and pencil…it’s just me. As much as love the ease of moving things around in an excel document, I miss the writing and figuring. Thank you for the reminder! 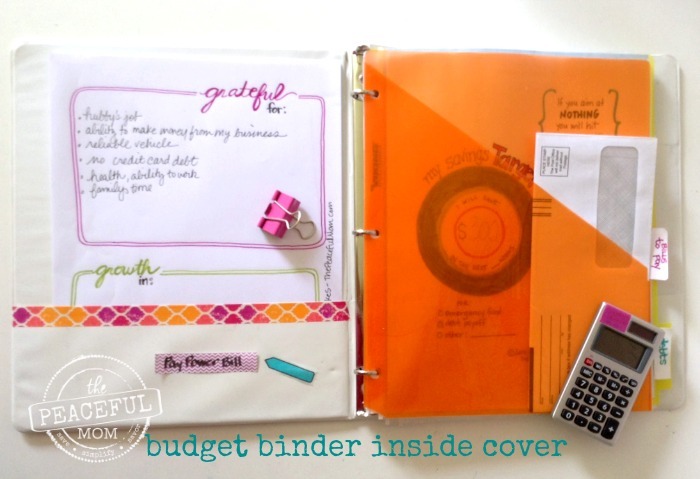 Thanks so much for linking to my post on budget binders! Kimberlee, thank you for this post!! I can’t believe I hadn’t thought of this – I’ve been trying to use a software program to accomplish this same result but it’s quite uninspiring… really uninspiring… and I find myself not using it consistently like I said I would when I purchased it 🙁 It never even occurred to me to MAKE MY OWN! You have just blown my mind and quite possibly helped my finances in the process! Thank you my friend!